As a parent, what do you do when you are tired of reading the same stories to your kids, over and over again? Well- you start telling your own. And that is what Seattle mom, Erin Turnley did. With three little ones at home and a passion for writing, she wrote and created Quigley the Caterpillar- a story of a mighty caterpillar who admired many and learned to, most importantly, admire himself. With her manuscript complete, she needed to figure out how to publish it. Determining that an interactive storybook app made the most sense, she partnered with Nation9 to develop and distribute Quigley across the Amazon and iTunes marketplaces. Quigley the Caterpillar, written by Erin Turnley and illustrated by Pamela Goodman, is available for sale in the Amazon App store as well as iTunes. 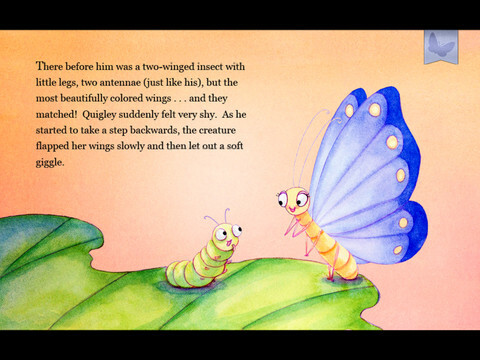 Quigley the Caterpillar is a gentle story of a caterpillar who admires a beautiful butterfly and he wishes he could be just as beautiful. Some of his friends help to transform him, with little success. But with the help of another friend, he learns to trust and wait and he too will be something special. The flexible settings (which are always important in an app) include the ability to turn the music, ‘animal sounds’ of joy or sadness and the narration, from loud to soft or even off. To me this story is about support, friendship, patience and trust. 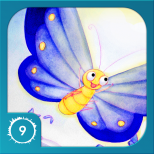 Nation9 is proud to present “Quigley the Caterpillar”, a storybook app written by Erin Turnley and illustrated by Pamela Goodman. 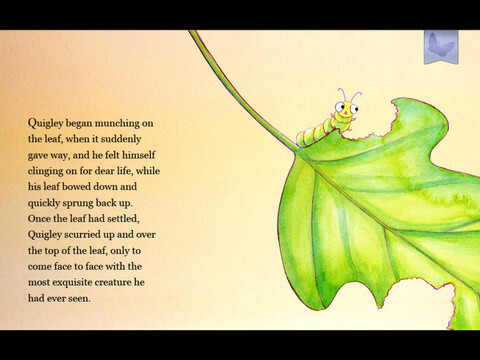 This delightful interactive story beautifully paints a picture of a little caterpillar’s journey of self- acceptance and belonging. Quigley is sure to become a life-long favorite of young children and parents! Quigley the caterpillar was very content with his simple life in the forest until he encounters a beautiful blue butterfly named Bertina. Now Quigley can only see himself as a plain old caterpillar and wants nothing more than to fly gracefully through the air like Bertina. Quigley will do just about anything to be just like his new butterfly friend. After an embarrassing stunt, a wise old dragonfly named Eli teaches Quigley to trust that in time he will become everything he was created to be.